Many, many thanks to those of you who have already contributed! I don’t know if you’ve ever seen The Avengers? I don’t mean the movie of the Marvel superhero-ey comics, but the classic black-and-white suave British comedy spy series from the 1960s, the one that made a star of the divine Diana Rigg. It’s bursting at the seams with sixties weirdo chic, yet it’s all done with a very British stiff upper lip (I’d like to see Gibbs from NCIS take time out to hand over change to pay the waiting taxi driver—with tip—while engaged in a desperate hand-to-hand brawl). Along with Doctor Who, its strangeness freaked me out when I was a kid, the way it would take the familiar and make it unsettling and disturbing (anyone who’s read my books might see a trend here). Anyway, we’ve been watching the best season, number 4. There’s a great episode called “The Girl From Auntie”, in which a series of murders are committed by a contract killer, who happens to be a little old lady using Double-O knitting needles. The hero tracks the needles to a knitting class, Arkwright’s Knitting Circle, in which the ever-superb Bernard Cribbins teaches knitting by reciting instructions like the caller in a barn dance. It’s quite splendid, absurd and innocent (on the surface, at least)—and while knitting is gently teased in the process, it’s affectionately done, without mockery. What we gain and what we lose. 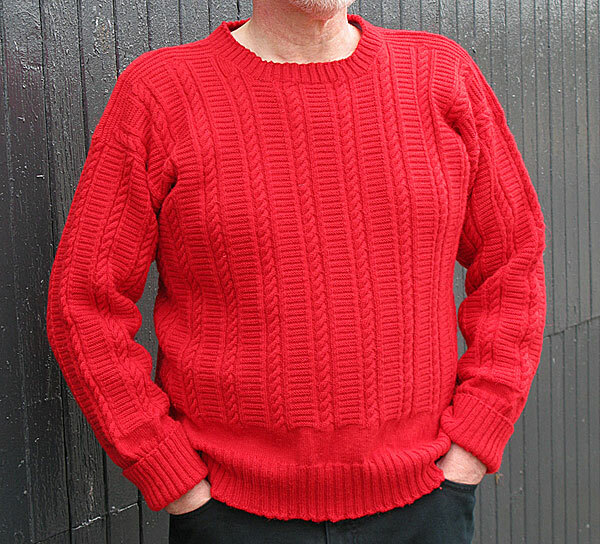 The red Filey gansey is now blocked and ready to be shipped to my friend down in Edinburgh. As ever, I am now consumed by anxiety that it won’t fit him, or that even though it matches the dimensions of his favourite sweater it’ll be the wrong shape, or something. You know. Blocking was quite a challenge, as the number of cables pulled the body in more than I’d expected. I’ve cast on the stitches for the next project, but only just, as and when I felt like it, so no photographs just yet. The welt is going to be a little different from my usual style, as it’s going to be knit in garter stitch instead of ribbing, but in the round, not with a split up the sides. This may have something to do with my cautious start! It’s going to be another cardigan, putting the eek in steek as I like to say, so that has to be factored into the stitch count as well. More on this next week. Finally, how dumb is television these days? Not all of it, of course, since there are still plenty of documentaries on quantum physics to keep me in my place, but still. We watched a BBC programme on seabirds around the coast of Britain. It had two highlights for me. The first was the presenter asking a ranger, after he’d been told that the number of nesting birds in one area had gone from 50,000-odd to 65,000, “So are the numbers increasing, then?”. Now THAT’s a Christmas gansey !! Love it! Someone once told me that the knitting episode, “The Man from Auntie”, opened (during the opening credits?) with a scene of a room full of women knitting, and that each of them was using a different style. I have never had any luck finding a copy to watch it for that scene. Do you recall anything like that? Hello Gordon, the gansey turned out, didn’t it? wow, nice fabric. It should keep your friend really warm and prevent bus accidents. I would want to deliver it person rather than posting, mostly just to enjoy the first look on his face. Hi Lynne, Thank you! It should come cinnamon flavoured, shouldn’t it? Marilyn, I’d love to deliver it in person, if Edinburgh wasn’t 250 miles away! I wore the gansey for the photo-shoot above, and I’ve never felt so self-conscious—even on a grey day. According to the story, in the Dales they actually did train children to knit quickly by having all the yarns wound together in one ball so that any child who was slow would slow everyone down; peer bullying did the rest. I just want to see all the different styles. I assume that one was using a Shetland belt, another a wooden knitting stick, another had a needle propped under an arm or in a twist of straw, and the others had different ways of holding the needles or feeding the yarn. 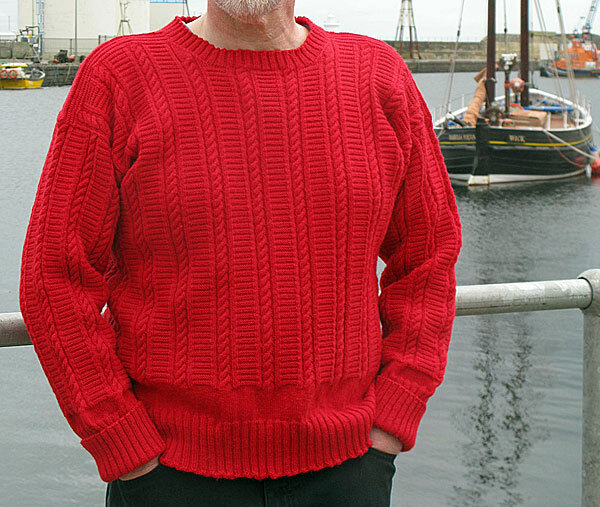 Hi Gordon well done on the gansey I love the cables. Are you really going to do a steek? this would scare the living daylights out of me, I can’t wait to see how it’s done. Yes, the Day Today was inspired, very well observed. Television is pretty dreadful, I regularly have to remind my other half that it can’t hear his complaints! We’ve got a program over here called “This Hour Has 22 Minutes” and is hosted by a Newfoundlander with an ascerbic (sp?) wit. Looks at a lot of Canadian politics and pokes holes in it. Gansey looks wonderful especially the cables- couldn’t miss it on a ski hill! Sandra, yup, a steek is an integral part of the design. Luckily I have Margaret and a pair of scissors to fall back on. Lisa, haven’t seen This Hour… but anything that exposes the absurdity of the world today is fine by me. The gansey isn’t ideal camouflage, is it? Unless you’re hiding out in a Tarantino movie! Though I have a passion for all the shades of navy blue out there, this red is just fantastic. Thank you for sharing all your work! What a lucky friend. Can’t wait to see what comes next! I especially like the bottom edge of the gansey. How did you keep the ribbing so loose? Mine is always so clingy. I’m following your cream welt closely, I always do the overlapped split welt, but it makes such a statement. The red certainly stands out, I’ll give it that. I rather fancy a navy blue gansey with red cuffs now, and maybe red shoulder straps? The welt is just a standard knit 2/ purl 2, that’s all. It’s not even blocked so it can stay concertina-ey. Maybe you need an oversize backside like the model in the picture to make it “hang loose” as it were! Congratulations; your red Filey gansey looks wonderful. Hi Ulrike, and thanks. I still haven’t handed it over to my friend, and the longer I keep it the more I want to hang on to it!